For the 2018-2019 school year, Wheeler High School will be offering AP European History. The AP European History syllabus is available for you to look over. The course will require approx. one hour of reading a night to facilitate the quick pace of the course, plus extensive reading guides. Please see this website for chapter outlines for McKay’s textbook if you have issues signing on to the textbook website/would like additional material. The exam date for the 2019 administration is Wednesday, May 8th. It is not recommended that students take this course at the same time as AP US History or AP World History. This course’s pace is much more aligned with the pacing and nature of AP World History than the pacing and nature of AP Psychology. If you have had me for AP Psych, please don’t expect the same style of class for AP European History. 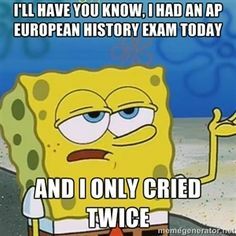 AP European history is a college preparatory course that provides students with a detailed study of European history from the 15th century through modern day. Students taking this course will participate in an academic experience that is equivalent to a freshman/sophomore college history course. In addition to mastering college level content, this course is specifically designed to increase student writing skills and analytic reading skills. Buy it USED from Amazon.com. Students that successfully command the course material may earn college credit by passing the annually administered AP European history exam. However, the individual college or university determines how many, or if, any credits will be granted for the AP exam score. In addition to providing an overview of important events and movements, the goals of AP European History are to develop (a) an understanding of some of the principal themes of European history, (b) an ability to analyze historical evidence and historical interpretation, and (c) an ability to express historical understanding in writing. The AP curriculum challenges students to develop higher-order thinking skills within a rigorous academic context that will mirror those students will face at the college level. Therefore, students are frequently required to read, analyze, synthesize, and evaluate primary and secondary historical sources and interpret them correctly. Students must also be able to comprehend, memorize, and apply facts learned from reading when necessary. These skills will be assessed through a number of tests, quizzes and writing assignments. Tests will be composed of multiple choice questions and thematic essays. Tests will be designed to resemble the types of questions that will appear on the AP European History exam. Students will very frequently be required to analyze a wide variety of historical documents and demonstrate their learning through various assessments. Students will also learn the Document Based Question (DBQ) writing process and will practice the DBQ numerous times throughout the course.